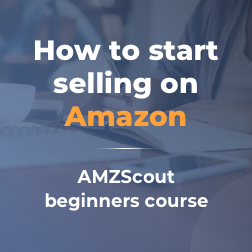 No matter what way you choose to sell on Amazon (if you are new to this download our guide), there are a few categories that stand out above the rest, for example, Toys & Games. With over 6 million products and counting, it’s no surprise that it’s also considered one of the most profitable categories, especially in Q4. 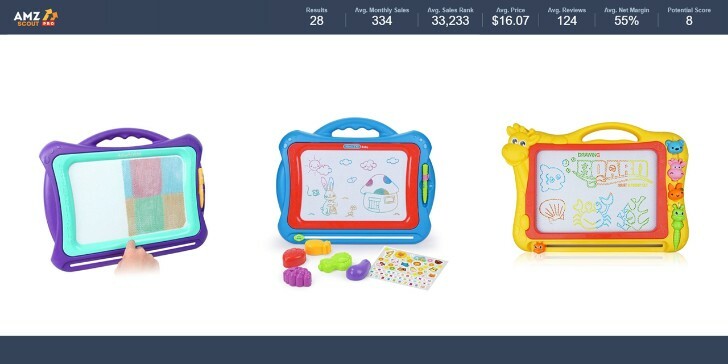 Toys is a hot arbitrage category due to the monopoly established by the toy companies you’ve already heard of, like Playskool, Hasbro, Lego and Barbie but the key is to not try to compete with the big guns here, it’s to dominate where they aren’t. You still have your classics toys, but also trending fads that take over like wildfire. This is an especially important category to sell in during Q4 because of the holidays. There are some pains when selling in toys & games. As mentioned before, the category is definitely monopolized, it also has many of the products that require things like batteries. Now batteries can be a pain when you are going through your shipment plans. But, there is a lot of potential and we are going to share some high potential niches that we found using AMZScout Pro Extension. 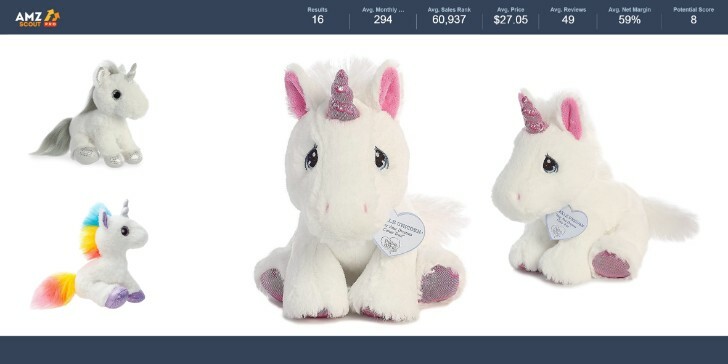 If you don’t believe in unicorns you should still believe in the profitability in this niche, it averages selling 270 times a month while having average reviews around 38! With these factors, coupled with selling for around $27 and a solid margin of 59% it’s no surprise this niche calculates to a Potential Score of 8. 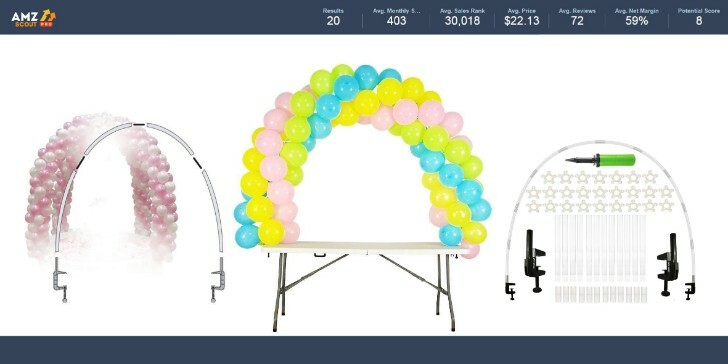 Largely a festive product, there’s no bad time for a balloon arch! It averages 380 sales a month for about $22 a pop with a 59% margin and still has less than 75 reviews on average per product listing. Still on the creativity train is play sliced vegetables. Filled with private label sellers, this niche is out in the open for you to find solid profits. 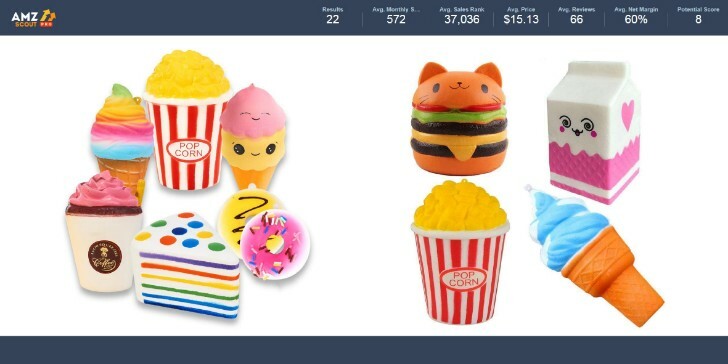 It sells for $19 a pop. At 215 sales/month it’s no surprise why there is a potential score of 7. 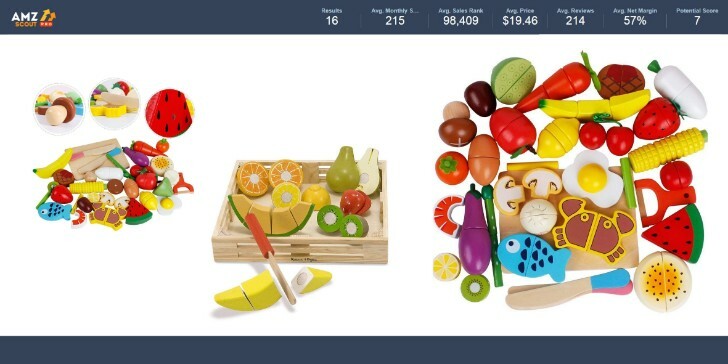 It’s a great niche to expand your keywords into due to the lack of a singular toy presence in the category. Its stats are awesome starting with 92 reviews and a margin of 59%. A smaller niche, but still a viable option if you are looking for a steady flow of income. 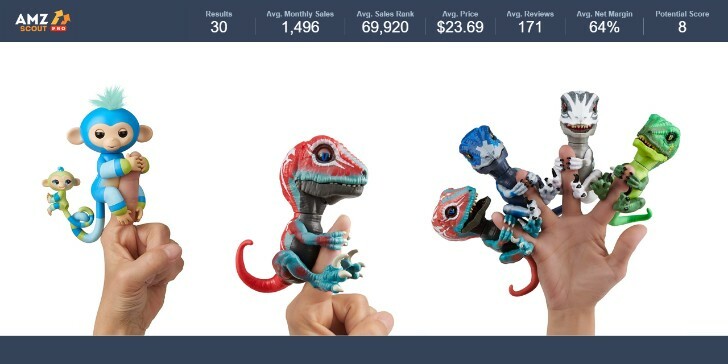 The products average 644 sales a month for about $14. Binoculars! 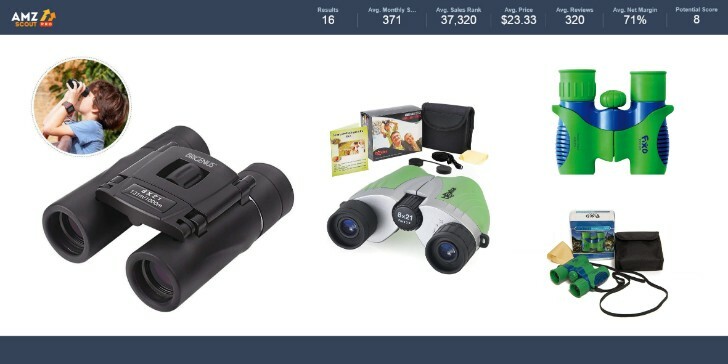 8x21 binoculars to be exact! 371 sales/month for $23 a piece and 71% margin, it might be time to dive into this as a seller. To find out more indicators if this product right for you, click on the potential score and see where the challenges might lie when entering this niche! This common science project is famous for keeping you entertained as well as your kids. If you can prepare yourself for the strong competition in the niche, you can be looking at some seriously solid profits. 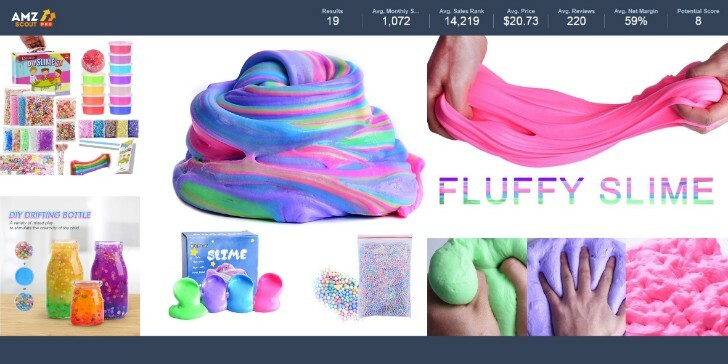 It averages over $20/product but sells over 1000 times/ listing on average and still has a margin of 59%. That’s a solid potential score of 8 if I’ve ever seen one! What stands out the most is the mere 66 reviews it averages and still runs about a 60% margin! With a high sales reaching over 570 and a price of $15, it’s not a bad time to time advantage of this cute trend! Popular during all times of the year, vests sell 275 per month for over $20. Its potential score of 8 sits strong with a good margin of 62% and reviews sitting at around 84 on average! 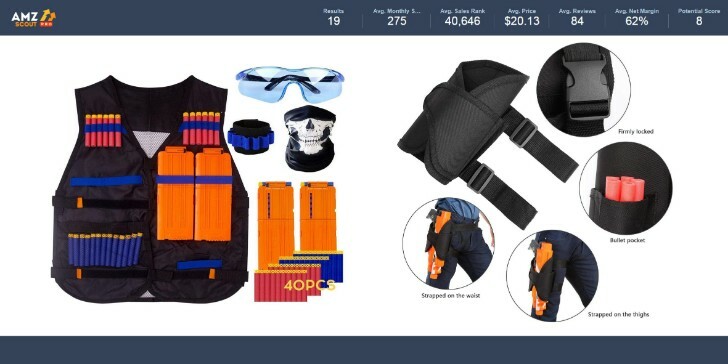 Remember that as you go into your next nerf gun war without the proper equipment to dominate. 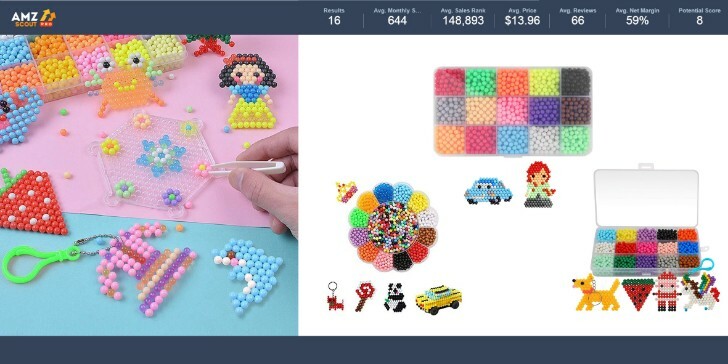 The wildly popular tiny toys average 1500 sales per month per item and cost about $23, it’s never a bad time to take advantage if you can! A good option for arbitrage. It’s a little bit of a wider category with more large companies all cashing in. With only 124 reviews, 334 sales, it’s a potential score we like to see when we take a leap into arbitrage!